Very helpful, very easy to use! Tenant File makes it easy to maintain a robust work order and maintenance logging system. Never before has there been such an easy to use Work Order Program, complete with all the Power and FEATURES you need! 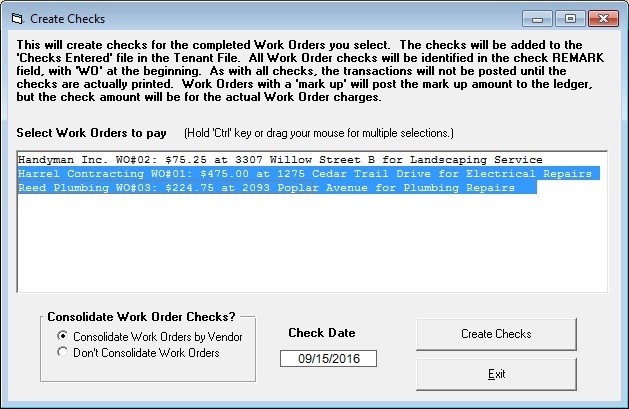 The Tenant File Work Order Program is fully integrated with tenants, rental units, vendors, and more! Now you can keep detailed information about all work done on your rentals, including materials and other details. 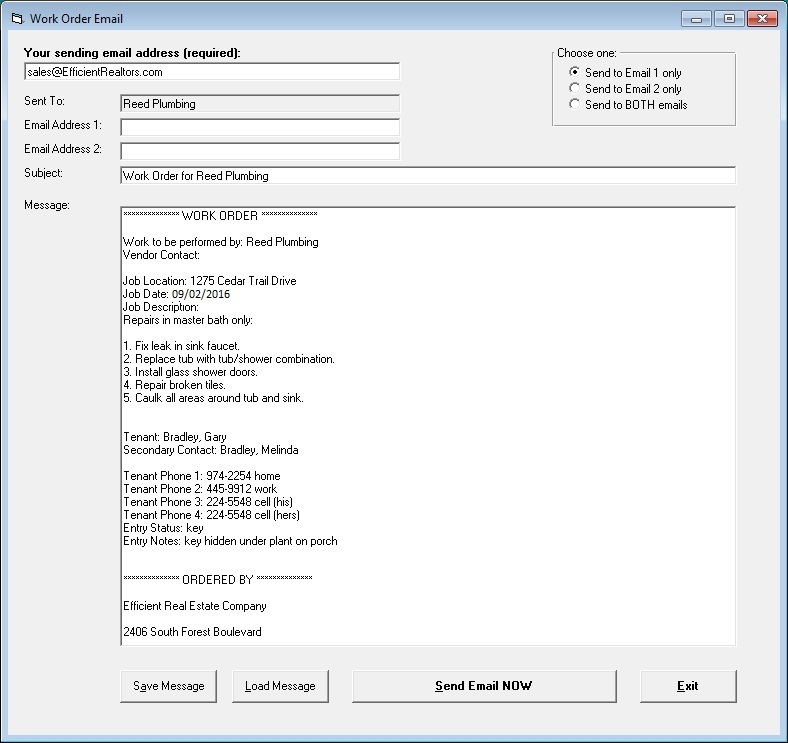 Email the vendors directly from within the program. Work Order Features Include . . .
Each Work Order can contain a great deal of information to help you maintain and track your Work Orders more efficiently. Information is automatically retrieved from the Tenant File Program, such as the Location, Vendor, Tenant, and Account Info. An easy to use drop-down lets you select your information quickly. There is plenty of room for the job description plus areas for additional entry notes, key location and a remark that will post to the Tenant File ledger. Every work order will automatically pull in the Vendor and Tenant phone numbers and email address so they can be contacted. A detailed material list can be logged at the bottom of the Work Order, with no limit on entry lines. To save time, you can copy a Work Order to a new Work Order, and you can easily find a Work Order by a number of different search options. To send a quick email to the Vendor for this job, just click on the 'Email' button. Or, you can print your Work Order right from the screen. This area of the program provides a large degree of flexibility never before seen in Work Order Programs of the past. You have the ability to view and manipulate your data with ease and quickness. Whether your work order has been just reported by the tenant, ordered to the contractor, or returned completed, you can sort and filter by many ways, find specific dates, names, or locations! This screen will also let you know the status of any checks that have been created for each Work Order. Once Work Orders are completed, you can issue checks. These may be either single checks (one per Work Order) or cumulative checks (one per Vendor). You may select individual Work Orders for printing, or groups of Work Orders. The ones you select will be transferred into the Tenant File ‘Entered’ Check file to await printing. Once printed, the amounts (with markups, if any) are posted into your Tenant File ledgers. Work Order Reports tend to be neglected in other programs. Not so here! All reports can be sorted in many helpful ways, and filtered to provide the information you really need. The Tenant File Work Order Program will pull in information from the main program such as a Vendor list to pick from. 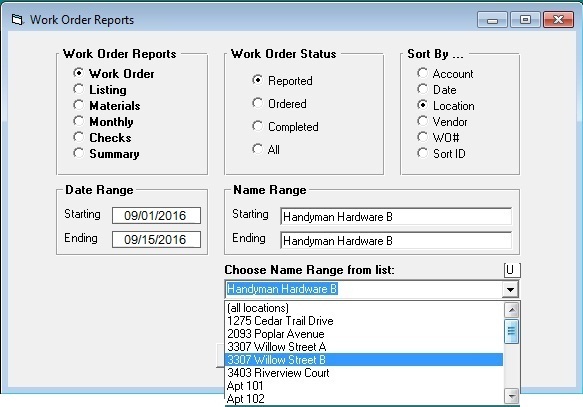 Just choose the report you want, select a starting and ending date, the status of the Work Order and you are ready to print. Any report can be printed to screen, to your printer, or to a file. From within each Work Order you can click one button to send a quick email to the Vendor. This email can be customized and saved for later use. You have the option to send to one email address for the Vendor, or both email addresses. It's quick and easy! When ready, just click the 'Send Email NOW' button. The Tenant File has made is really easy to create and maintain information on the repairs and maintenance of your rental property.